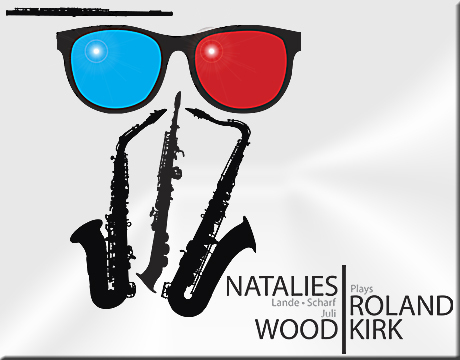 Natalies Wood Plays Roland Kirk,is an ensemble that re-examines the oft-explosive music of saxophone giant Rahsaan Roland Kirk. Kirk, a blind musician who died in 1977 at age 41, commanded a monumental technique in a wide range of jazz idioms, though he’s probably most famous for having played three horns at once. This was not a mere stunt but, rather, a means for unleashing torrents of sound and a profusion of ideas. 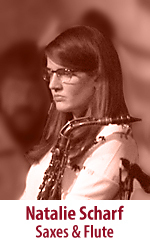 To try to capture the fervor of Kirk’s work, while also exploring it from contemporary perspectives, Juli Wood last year convened saxophonists Natalie Lande and Natalie Scharf to join her in the new band (hence the name Natalies Wood), with Matt Ferguson on bass, Brian O’Hern on piano and Mike Schlick on drums. Come and enjoy the beautiful, haunting and unique music of Rahsaan Roland Kirk! “I was blown away thinking how can this man play three horns at once and still be making such beautiful, soulful music” His playing the tenor sax, stritch (modified alto sax) and manzello (modified soprano sax) all at the same time is not a gimmick! He was a true jazz genius and a hell of a saxophonist and flautist. The band, Natalies Wood Plays Roland Kirk is dedicated to playing Kirk’s wonderful jazz compositions, and it takes three saxophonists to play his tunes! Natalie Lande began her musical studies at age 4 in classical music before discovering her love for jazz improvisation and composition. 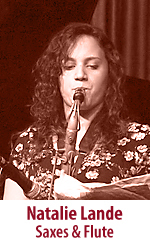 In 2013, Natalie was named 2nd place winner in the Civic and Arts jazz improvisation competition and was awarded the prestigious Luminarts fellowship grant for jazz improvisation in 2014. She graduated from the University of Illinois with a BM in Jazz Performance and a BS in general chemistry. Natalie recently completed her Masters Degree in Jazz Composition at Depaul University, and performs and teaches around the Chicagoland area. 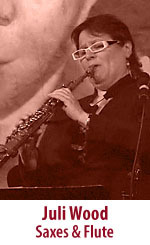 As a composer, she has written numerous pieces for a variety of ensembles- jazz big band, Latin jazz ensemble, a 7-piece rock band, various jazz combos and saxophone quartet. Natalie Scharf comes from multiple generations of both musicians and music educators, and is carrying on the family tradition. She graduated from Northern Illinois University in 2011, and has since been in demand as a saxophonist, woodwind doubler, arranger, composer, and band director. Lately, she can be heard with various jazz small groups, big bands, a punk rockabilly venture, and a multitude of other musical endeavors. 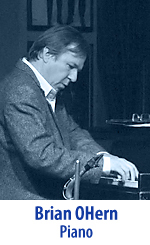 Pianist Brian OHern graduated from the Berklee School of music in 1990. After road time with the Artie Shaw and Glenn Miller Orchestras, he moved back to hometown Chicago and conjoined into the Roscoe Village jazz scene. In 1996, OHern began leading a big band of his own known as the Model Citizens. 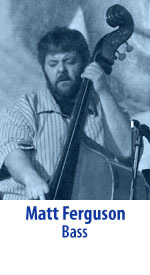 Acoustic and electric bassist Matt Ferguson has been active on the Chicago jazz scene since 1991. A native Chicagoan, Matt attended Lane Tech and DePaul University where he studied jazz and classical bass performance. He has been an in-demand sideman since the age at 21, performing regularly with artists such as Lin Halliday, Jodie Christian, Ron Dewar, Geof Bradfield, Mike Allemana, Pat Mallinger, The Model Citizens and George Freeman. He was a regular member of Von Freeman’s quartet from 2003 until Vonski’s death in 2012, playing every Tuesday night at the famed New Apartment Lounge on 75th St. Matt has gigged with numerous players of international renown such as Steve Coleman, Eric Alexander, Julian Priester, Mickey Roker, Chico Freeman and Arturo Sandoval. He, drummer Gerald Dowd and guitarist Mike Allemana currently co-lead a free-funk band called The Regulators. 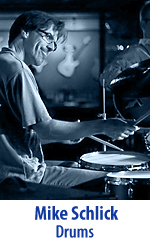 Mike Schlick is a busy jazz and blues drummer in Chicago. He leads his own organ trio at Buddy Guy’s Legends. He’s in Mike Smith’s quartet at Andy’s every Wednesday night. Mike also has performed with Sheila Jordan, Scott Hamilton, Von and George Freeman, Jimmy Johnson, Lurie Bell, Dave Spector, and Guy King at numerous clubs and festivals in Chicago and Europe. *Live Recording at Constellation in Chicago with Kitt Lyles on Bass, Gerald Dowd on Drums.